Our Lexi&Bö Hoodie for men with the cool shark motif "Sharky" on the back and the inscription "Lexi&Bö" Divewear on the front must not be missing in your wardrobe. 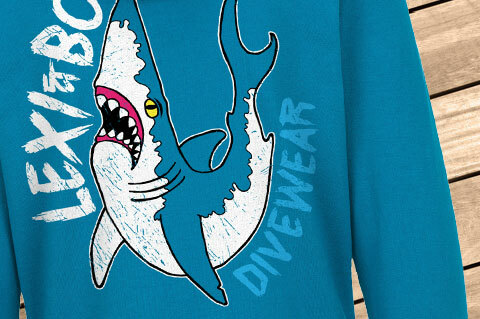 The big shark imprint in comic style is absolute unique and its used look effect is super trendy. The crazy lettering completes the design. 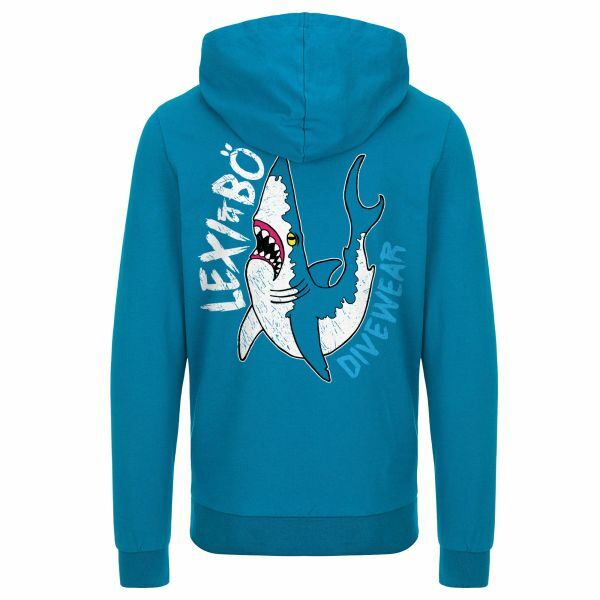 The loose-cut hoodie comes in blazing mykonos blue and gives your outfit that certain something. 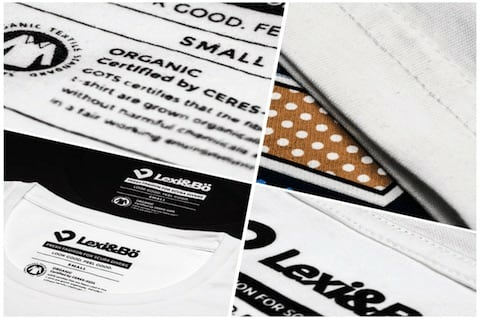 The printing ink and the material are 100% chemical-free and thus protect your skin and the environment. The big hood is provided with a wide white drawstring. On the front you will also find a practical kangaroo pocket. The Italian Fleece fabric of our hoodie is made of 100% organic cotton and gets a special soft-touch effect through machine roughening. As a result, it feels pleasantly soft - inside and outside and keeps you warm: just the right thing after a great dive! 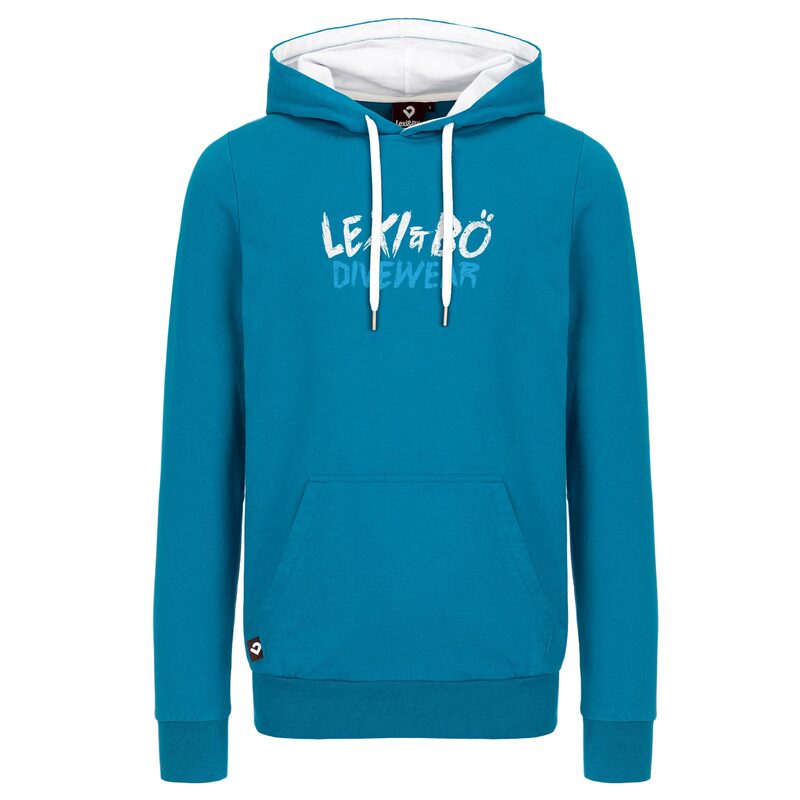 Our soft, cuddly hoodies are made from cold-resistant Italian fleece. Here only organic cotton was used. The high-quality yarns made by Otto from Germany make our hoodies particularly durable, because the individual fibers of these yarns are particularly long and therefore very hard-wearing. The material is smooth on the outside and cuddly soft on the inside. All of our hoodies were fairly and environmentally friendly produced in Portugal and printed in Cologne. Customer evaluation for "Sharky Hoodie Men"